Have I lost everyone yet? Not that I've been trying. This month has just been a hectic one, and with 5 stitches in my head and greasy looking hair I just haven't felt up to par for picture taking. So I sincerely apologize. January will begin with a lot of changes! I'm going to come in with a bang :) For now, I wanted to share with you the next 14 days on my Christmas wish list...and one extra goody! I promised you a shoe lust list!! The only problem with this is I created it a day or so ago and I found more that I'm crushing on!! 2. Christian Louboutin- Lucifer Bow ($995) I NEED THESE!! 5. Miu Miu- Canvas polka dot sandal ($495) LOVE the green but can't find them online anywhere! HELP please!! 6. Miu Miu- Harness platform bootie ($790) I adore these!! Which ones are your favorites? 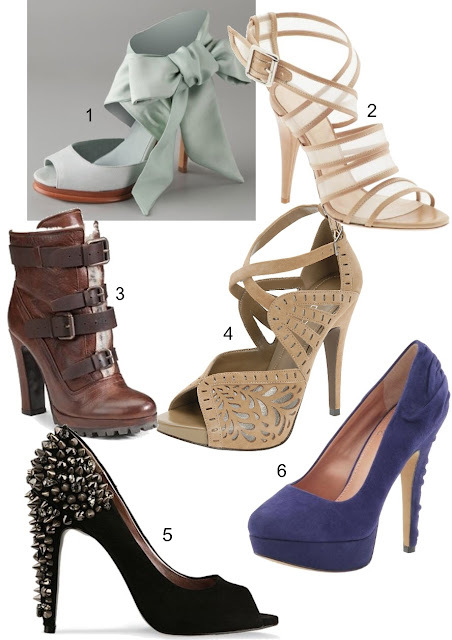 Like I said- these are just a few of the shoes I'm crushing on right now. I hope you all are ready and excited for Christmas. I'll try to post a few more times before then but if not Have a very merry and happy Christmas!